Little Mrs. Married: Girl's Night! Last night, I went to dinner with some girlfriends of mine. If you know me well, you know i am not much into eating japanese, chinese or lebanese food! It's almost become a joke where if a group is deciding where to go eat, i'll usually say, "I don't care, as long as it's not one of the -ese's!" & they all know that means no japanese, chinese or lebanese! I recently branched out & realized that i do like chicken shawarma. I have always liked sesame chicken, but that's pretty much it when it comes to chinese! Sometimes i get a craving for chinese (like once a year!) & i always regret it later! HA! I haven't had much japanese, but i hate sushi! I tried it once (& it was not a raw kind) & i literally gagged. I haven't had any since! Gagging is not fun! BUT one of my dear friends Amanda was coming in from California! 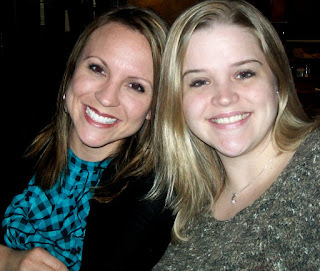 When she comes in town, we try to get together for dinner & let her pick the place! 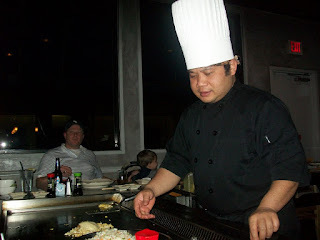 She picked Ichiban's on the Hibachi. I agreed to go. And guess what? I LOVED IT!!! So delicious! Now...i did try a sushi & i didn't love it. Wasn't as bad as last time (years ago) & i did not gag (though i nearly did!). I only tried it because she said it had avocado & crabmeat in it & i like that. Some sauces i tasted weren't so good! And they insisted i put the entire thing in my mouth - i think that is more of what makes me want to gag than the actual taste of the sushi! Anyway - the sushi was not terrible, but i didn't love it. Now, let me tell you about these wonderful girlfriends of mine. I just love them. & I miss them. 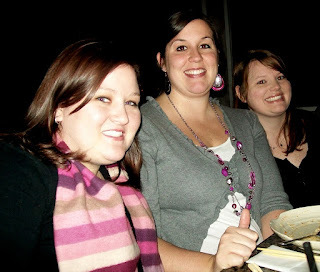 Three of us (me, Ali & Amanda) were roomies at one time. At that time, we were also good friends with Amy & Becca. (& Jenn! But she couldn't come eat because she was in Disney! So saddy!). Most of us used to go to church together. We also were involved in Springhouse, a nearby home for troubled teen girls - we went there every other week (for YEARS) & did a Bible study with those girls. We also were just very good friends back then & hung out a lot. Years have passed. Ali's gotten married (& is now expecting her first baby! A boy!). I got married. Amanda moved to California!! etc etc! I do not see these girls all the time, but LOVE getting together with them & we make sure that happens as much as possible! 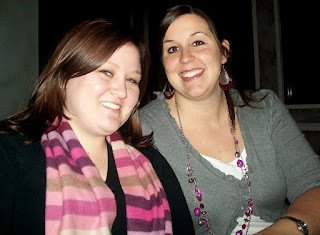 So anyway - some pics of us from our hibachi night! It was a great night! I can't wait to get together again!! What beautiful girls you all are! Looks like tons of fun! I'm not a sushi eater and I had a girls night recently at a sushi place. 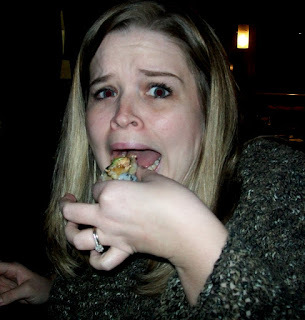 I got teriyaki chicken, but my friends "forced" me to taste a California roll....icky!!!! I don't like fish at all, so that's the worst part. I have never tried sushi and I never will. Promise!! We have an Ichiban nearby. I went once and it definitely was yummy! !